Release Date: September 22nd, 2006 (Angelika Film Center) by Magnolia Pictures. Directed by Heidi Ewing and Rachel Grady. BASIC PREMISE: A documentary about Evangelical Christian youths who attend “Kids On Fire”, a religious summer camp in Devil’s Lake, North Dakota. 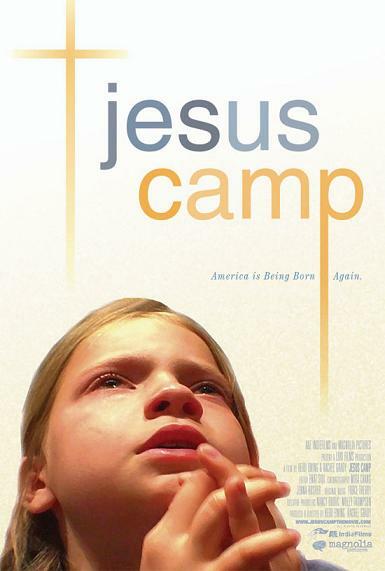 ENTERTAINMENT VALUE: Jesus Camp focuses on the fascinating and disturbing experiences of three young campers. Every summer, these Missourian campers and many others from around the nation attend Kids on Fire, an Evangelical youth camp run by Pastor Becky Fischer. On the first day of camp, they all gather together to praise Jesus and to cleanse themselves from their sins—they even burst into tears and rattle their bodies during all of this as if they were possessed. In an alarming scene, Levi starts preaching to a crowd at the age of 12 and says he was “saved” when he was 5. 9-year-old Rachael who dreams of becoming a missionary and already spreads her love of Jesus to random strangers she meets and tries to convert. Then there’s 10-year-old Tori who loves to dance for God. Each of these children could have easily been in a Christopher Guest mockumentary given how extreme and absurd they seem. Pastor Becky Fischer communicates—or, rather, indoctrinates—her campers through her energetic speeches and through symbolic visual aides. In another absurd scene, Fischer tries to fling and stick an elastic item onto a representation of the brain. Before giving one of her speeches, she freshens up in front of a mirror and, interestingly complains how exhausted she feels from her job. Mike Papantonio, a radio host for Christian Air America confronts Fischer on the air and points out her fanaticism. The campers’ parents seem just as religiously fanatic as their kids. One parent believes that this country is going downhill because the study of Jesus was taken out of the public school system, so she home-schools her child. In her mind, those who love and focus their lives on Jesus will go to heaven and everyone else is pretty much doomed. What makes this documentary so compelling, though, is that co-directors Heidi Ewing and Rachel Grady merely observe the absurdity without directly commenting about it. They present a well-balanced look at the Evangelical Christian youth movement without any preaching (from the directors, at least). They don’t claim that these youth are being brainwashed, which is too strong of a word. It would be very interesting to document these kids when they grow up and to observe any changes in their religious outlook on life. SPIRITUAL VALUE: Philosopher Karl Marx once stated that “Religion is the opiate of the masses.” In many ways, Evangelism is the opiate of these Christian youths, but they take it to the extreme which leads to thought-provoking questions that can only be answered through time. . How will their indoctrination affect their transition into adulthood? Will they rebel at some point? What’s certain, though, is that anything excessive cannot be healthy physically or psychologically. IN A NUTSHELL: Compelling, well-balanced and very disturbing.